Some well-intentioned knucklehead was insinuating in the comments box of my Top 100 LP’s post from a couple weeks ago that no one really listens to TELEVISION; they’re just a band that critics & pretenders like me like to put in lists because we think we’re supposed to. Or something along those lines. I sort of know from whence such hostile musings spring, actually; there’ve been times, particularly when listening to “Adventure” or even sometimes to the mediocre Side 2 of “Marquee Moon”, when I’ve wondered about the band myself. Then I remember that throughout the back half of the 80s, after discovering “Marquee Moon”, the “Little Johnny Jewel” 45 and ROIR’s “The Blow-Up” cassette, how I played my Television records/tapes into the ground, and how I then bought an incredible bootleg LP of early recordings with Richard Hell on bass called “Double Exposure”, and then called the band one of my all-time favorites. For real. 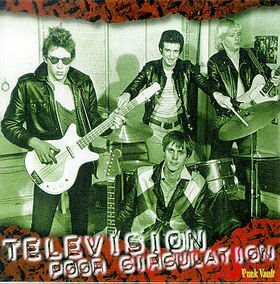 About 6-7 years ago my pal JB fried me up two CD bootlegs of 1974-75 Television that I loved – one was the expanded CD version of “Double Exposure”; the other was this Punk Vault bootleg of rehearsal/demo recordings (with a few live bonuses) called “Poor Circulation”. Both showcase a much different and more rocking Television than the version we’re more faimiliar with – far more NEON BOYS than “Marquee Moon” for sure. There is one on here – I think it’s “U.F.O.” – where the soaring Verlaine guitar lead near the end was totally copped for the song that became “Marquee Moon”, so these guys weren’t beyond wholesale swipes from their own catalog and complete shufflings of riffs, notes, and patterns between their various songs. I like it. “Poor Circulation” is much more raw and punkish than the popular stereotype of the band, and goes a long way toward explaining why the writers of the day had no quarrel with calling them punks from the word go. That might look strange from our 2006 vantage point, but makes a lot of sense when you hear this excellent bootleg. If you get a chance to hear “Double Exposure”, too, by all means – run, don’t walk, ‘cause it’s even better.